One of the sources of information linked from the YaST landing page is the brand new tutorial titled “Creating the YaST journalctl module“. As the title suggests, the tutorial presents a very simple example of a YaST module developed from scratch in pure Ruby. The document is focused on the tools and the overall architecture trying to balance nicely theory and practice. All the example code and files used in the tutorial are available in a git repository that follows the learning time-line, with every tag corresponding to a step in the tutorial. But this tutorial is not the only evidence of a flourishing Ruby future for YaST. The last months have seen the born of several new YaST modules written in Ruby from scratch. The source code of all of them is available at Github and the modules themselves are all included and directly installable on openSUSE Tumbleweed, with the exception of the I/O Channels module, available only for SLE since it’s targeted at System z mainframes. The module for managing the system-wide configuration of the fonts has being available for some time at its Github repository. Recently, with the inclusion of the package into openSUSE Tumbleweed, his author has blogged about it and about the status of fonts in openSUSE in general. As you can see in the screenshot, it offers fine-tunning for the sans, serif and monospace generic aliases in the system and how they should be rendered. If you haven’t heard about Docker, you have probably been disconnected from Internet during the last couple of years. 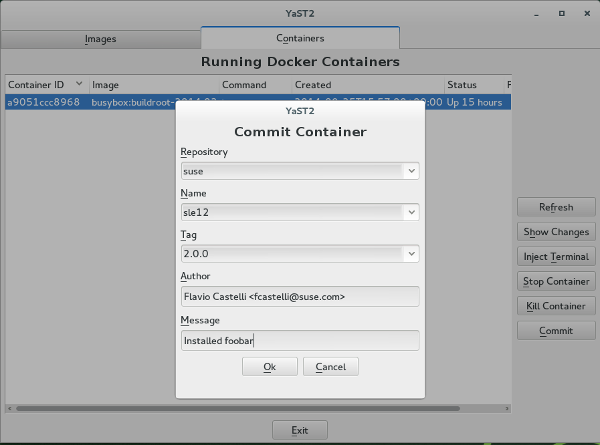 Docker is becoming the de-facto standard for software containers and, of course, YaST couldn’t be oblivious to it. In the github repository of YaST2-Docker you can see a whole description of the several handy features offered by this module alongside some nice screenshots like this. The submission of this new module into Factory/Tumbleweed was recently announced in the Factory mailing list. 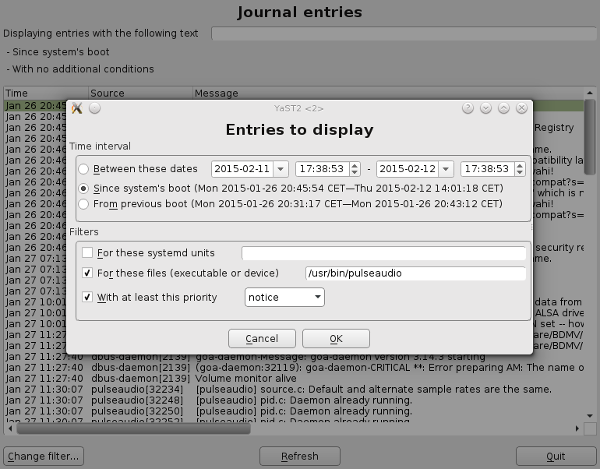 As you can see in the screenshots, it displays the systemd journal entries in a table with a search box providing grep-like live searching. In addition, it allows to filter the entries in the list by date/time, unit, file or priority. As a bonus, the module was used as inspiration for the already mentioned new YaST development tutorial. The first YaST module to be ever written in Ruby from scratch is a nice source of coding examples. Even if it’s not very likely that you have a mainframe just lying there for playing and fooling around, you can still visit the module’s github repository and learn from it. delighted to see that yast remains a vibrant and thriving thing in its own right, this openness is exactly the right way to go in keeping it that way. on another question: when do we get opensuse 13.2+1?